Achieve massive computational performance with a single processor personal workstation. The HP Z420 Workstation offers your choice of Intel® Xeon® E5-1600 v2 and E5-2600 v2 series processors—with base clock frequencies of up to 3.7GHz and the new Intel® C602 chipset. 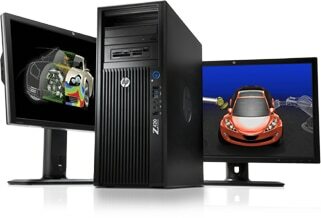 Delivering support for up to 8 cores of processing power, the HP Z420 never slows you down. And thanks to optional Thunderbolt™ technology, you'll transfer data at lightning-fast speeds with the ability to connect to high-resolution displays and high-performance data devices over a single Thunderbolt™ cable. 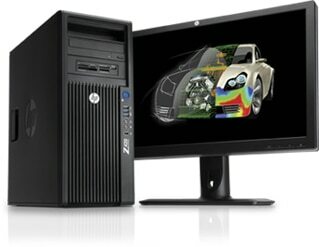 Built to support next generation PCIe Gen3 graphics, the HP Z42 0 currently offers a breadth of AMD and NVIDIA® professional graphics cards from Pro 2D to high-end 3D, up to the NVIDIA®Quadro® K6000. With a 600W, 90% efficient power supply and support for up to 8 HP Performance Displays, the HP Z420 can maximize your productivity with the freedom of seeing and doing more all at once. Note: Fourth 3.5-inch drive occupies one external 5.25-inch bay. Fourth 2.5-inch drive is installed into top optical bay handle.